Shoot through outer space with Universal Slots and win big progressive jackpots, get double payouts, and FREE SPINS in this awesomely intergalactic slots game! Put on your most trusted space suit and helmet and get ready for an intergalactic adventure like you’ve never dreamed of! 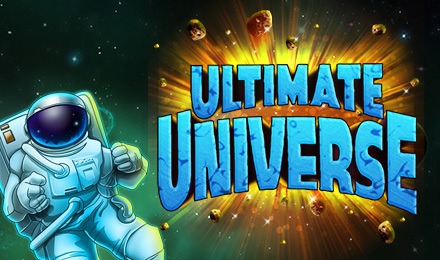 Ultimate Universe slots offers five fantastic reels and twenty five paylines with Wild symbol substitutes and Scatters for FREE SPINS and double payouts! If you can stomach the multiple twists and turns in a weightless space, this game is right where you want to be. Travel between uncharted galaxies in the blink of an eye and collect out of this world winnings in each one!